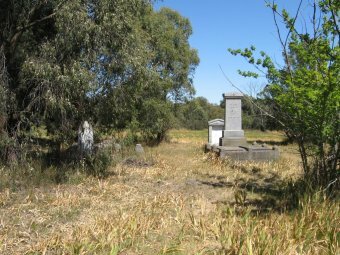 Outtrim Cemetery is a small rural cemetery set in woodland one kilometre east of Outtrim Recreation Reserve on the Leongatha South Road. It is also approximately 12 kilometres south of Korumburra, off to the left approximately 4 kilometres, as you travel along the Korumburra to Wonthaggi Road . The area was originally used for farming but coal was discovered in the area in 1892 south of Outtrim Railway Station and with access to the markets for the coal being established, the Outtrim and Jumbunna coal fields developed in the mid 1890s. The township grew up by the mine and was named after the Honourable Albert Richard Outtrim, MLA, Minister of Mines in the Victorian Government at the time. By the 1940s only a small number of companies were working the mines in the area and by the 1980's the township of Outtrim had virtually disappeared with the town area being only a few buildings and the land returning to farming. A school was commenced in 1895 and when the coal mines were at their peak, more than 200 children attended the four-roomed school. When coal production declined and then ceased with the closing of the mines in 1914, the population dwindled very quickly with most moving to Wonthaggi where a large mine opened in 1909. The cemetery currently has fifteen marked graves, with the earliest dating from 1902. It is believed that there are a total of 220 burials in the cemetery, with last burial being in 1946. The burials are located in the northern portion of the cemetery, comprising an area of three acres. The cemetery was established circa 1894 consisting of ten acres. The remaining seven acres in the southern area of the cemetery area was fenced off and timbered. In 1994, the Land Conservation Council recommended that this area of seven acres be reserved for the preservation of native plants, while the other portion was recommended to be set aside for Historic and Cultural Features Reserve. 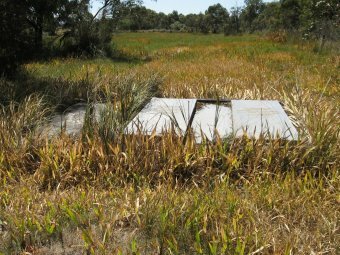 The entire cemetery reserve is now reserved permanently for nature conservation purposes and is managed by Parks Victoria. In the Victorian Government Gazette: No. 26 – 23 March, 1983, page 663, land to the rear of the Outtrim cemetery was rezoned from rural to public purposes to enable the establishment of a new Garbage depot in the area. Burials in the cemetery were mainly those involved with the coal mines, trustees of the cemetery, and local people. * Robert Gillespie – Storekeeper. * Challis Edward Easton - Baker. * Frederick Cayley – Miner. * George Matheson – Farmer of Moyarra. * John Olden – Farmer, of Outtrim. * Thomas Mc CRORIE, Underground Manager, aged 39 years who died on the 19 th September, 1897 and was buried 21 September, 1897 . He was born in Ayrshire , Scotland , and had been two and half years in Victoria . Not all people buried in the cemetery remained. 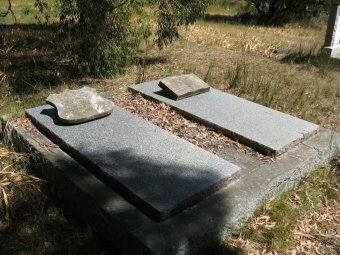 John Duffy, aged 29 years who died 2 May, 1899 was exhumed and reburied at Warragul Cemetery on 11 December, 1900 . The cost of removal was one pound, ten shillings. One small, oval memorial found in the cemetery, attached to a metal cross, notes In Loving Memory of Joyce Mary Matheson and John (Jack) Matheson, tragically drowned at Inverlock. Beloved children of Ethel and John Matheson . Currently there are conservation activities being undertaken at the Cemetery as the site has been neglected for many years and most of the markers of the 220 people buried in it have been lost. The first two issues identified for this conservation is to try to locate a map of burials at the cemetery (but it is believed that such a map does not exist), and to try to identify and locate the original paths in the cemetery. 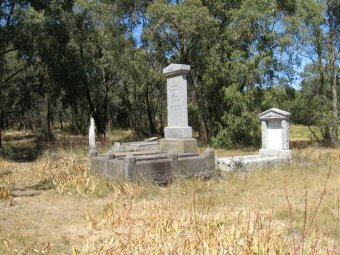 Bush fires have destroyed the wooden grave markers over the years, leaving only the stone monuments. By 1980 interest in the cemetery had waned. Following an inspection of the cemetery in July 1980 by the Cemeteries Officer for the Health Commission of Victoria it was noted that the Secretary of the Outtrim Cemetery Trust “informed me of a general lack of interest in the cemetery even from people with rights of burial.” He also noted that “ the township of Outtrim no longer exists and only 22 families are living within the immediate vicinity of the cemetery. Most of the funerals were now taking place at Korumburra and Leongatha .” He also noted that the Health Commission had no objection to the Lands Department's proposed re-reservation of the seven acres of the Outtrim Cemetery reserve. The cemetery is still there today, with access to it via a wire gate from the main road running by the cemetery. There is a sign identifying the cemetery to the right of the gate. If anyone has any further information on this cemetery, I would appreciate hearing from them. Education Department of Victoria : Vision and Realisation: Volume 3 ; 1973. Genealogical Society of Victoria : Outtrim Cemetery: Register and Headstones – 3.1897 to 15.4.1946. Department of Human Services Cemeteries Unit ; File: H-CEM-381.Outtrim Public Cemetery . 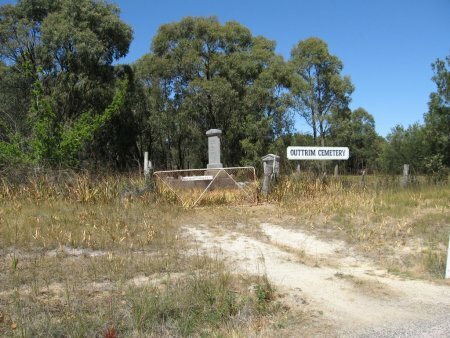 Department of Sustainability and Environment Historic Places Unit: Outtrim Cemetery. Conservation Officer; Outtrim Cemetery : Discussions in regards to the cemetery, 2008.